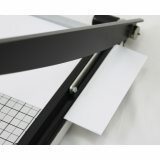 Paper trimmers are widely used; at home, in the office, in art and photo studios and printing centers. Paper trimmers provide a precise, clean edge cut with their built-in grid lines and straight edge guides. Paper trimmers can precisely cut single or multiple sheets of regular paper, card stock and specialty papers. Some trimmer models can cut heavy materials such as matteboard, plastic and metal foil. Some trimmer models can cut up to 40-50 sheets at once with precision, the key is a built-in paper clamp. A paper trimmer with a built-in paper clamp securely holds the paper stack while cutting thereby eliminating paper push out and uneven cuts. 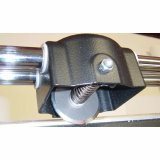 Rotary trimmers use a round rotating blade carriage that rides on a rail above the sheet. Rotary trimmers are availabe from small desktop units typically used for craft projects to large floor models designed for timming wide-format material.